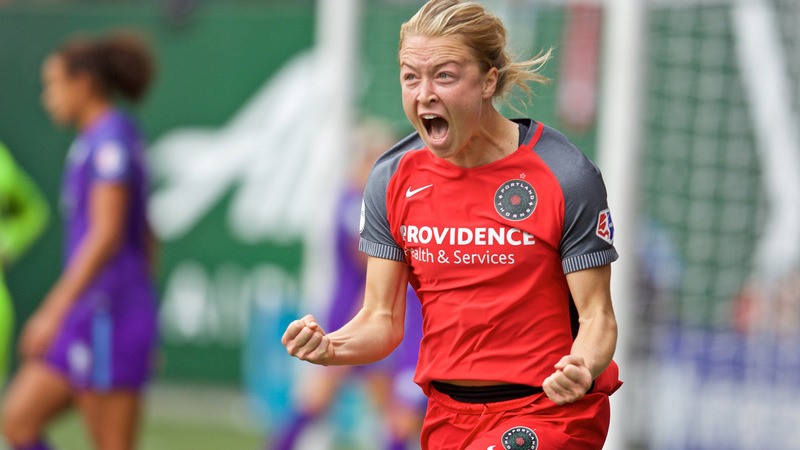 Portland, OR - Saturday October 07, 2017: Emily Sonnett celebrates a goal during a National Women's Soccer League (NWSL) semifinals match between the Portland Thorns FC and the Orlando Pride at Providence Park. Portland dispatched the Orlando Pride on October 7, 3-1, to move on to the final test of the season in what has been a four-year mission to get back to the mountain top. Williams will back on the field for the Courage and the Thorns will have to find some way to contain her. Not an easy task given how explosive a scorer she has proven to be. Portland, however, has a top-notch defense behind goalkeeper Adrianna Franch and defender Meghan Klingenberg. The Thorns should have every body and weapon available to them, sporting one of the deepest teams in the league. During last week’s semi-final game, Allie Long, Dagny Brynjarsdottir and Nadia Nadim all came off the bench for Portland, something that would seem un-fathomable for other teams in a playoff game, given the kind of talent those players possess. The key to victory for the Thorns is to get out to a solid start and jump ahead. The Thorns are at their best when they are aggressive and smell blood. But, they have been known for the occasional slow starts and lapses in play that have cost them in the past. If Portland jumps ahead early, and keeps the pressure on, it will be awfully difficult for the Courage to counter an equal attack. On a more downbeat note, this will also be the last game for both Nadim and Amandine Henry, both of whom will be playing in Europe next year. What a fitting farewell a NWSL title would be for those two players who have played like champions during their time in Portland. So, get out your Thorns scarves, your good luck charms, and all the good vibes you can send towards Orlando. Take a break from all the politics and downer news in the world and settle in for what should be a fantastic soccer game on Saturday afternoon. If the Thorns compete to the level they are capable of playing to, then expect another championship in Soccer City, USA this weekend.